The German-Chinese House is a bamboo membrane building with a walk-through surface area of 330 square metres spread over two floors. For the roof’s supporting construction, Markus Heinsdorff used eight-metre-long canes of Julong bamboo, a rare and particularly long type of bamboo from Southern China. Before the actual construction, the bamboo was treated with a special fire-resistant chemical and has received a certification for fire resistance. 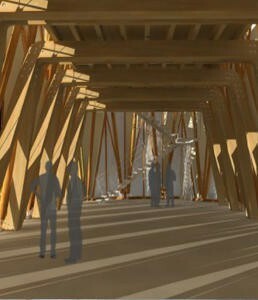 In the interior of the building, the artist worked with glue-laminated bamboo segments. For both materials, new connecting and finishing techniques, developed especially for this project, were used. The supporting beams of the bamboo segments, which measure up to six metres long, make a self-supporting room possible on the upper floor. Connecting joints of steel on the roof hold the bamboo supporting frame structure together. They are set in HVFA concrete with a high concentration of flue ash. The roof consists of special PVC membranes. The building is environmentally friendly and mobile: it can be taken apart and reassembled elsewhere. All materials are either reusable or completely recyclable.